A 76-year-old female, with a blameless medical history other than well-controlled depression, was referred for urgent investigation due to weight loss and diarrhoea. 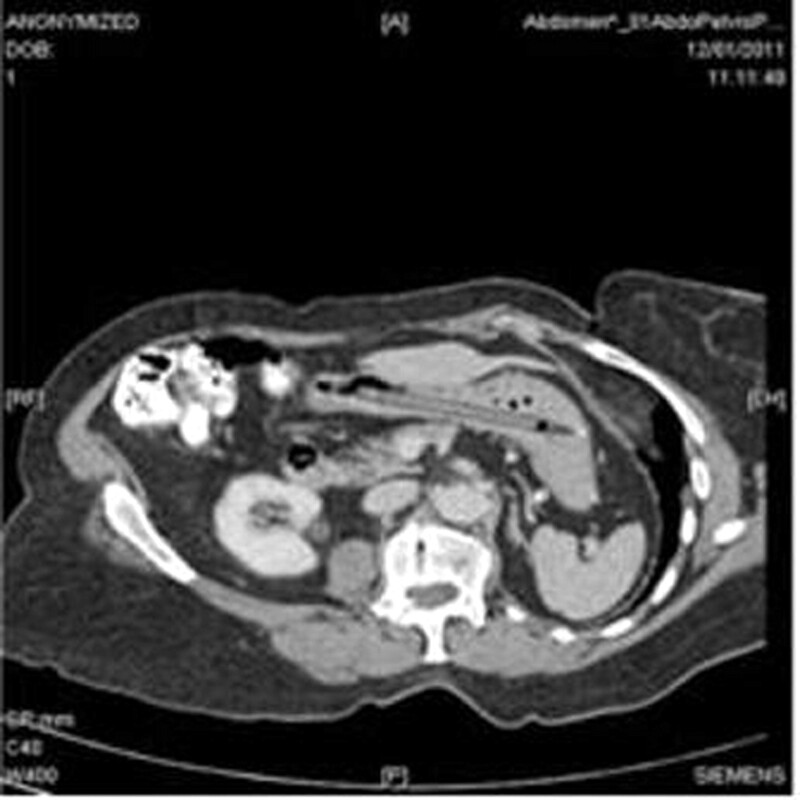 A flexible sigmoidoscopy demonstrated severe diverticulosis and a subsequent CT abdomen showed a linear foreign body in the stomach but no other abnormality (figure 1). Her symptoms resolved spontaneously. On subsequent questioning, she recalled unintentionally swallowing a pen 25 years earlier. While she was interrogating a spot on her tonsil with the pen she slipped, fell and swallowed the pen by mistake. Her husband and general practitioner dismissed her story and plain abdominal films done at the time were reported as normal. A gastroscopy demonstrated a plastic felt-tip pen sitting in the lumen of the stomach without evidence of any gastric damage. The case was discussed at the gastrointestinal multi-disciplinary meeting and the consensus of opinion was that despite being there for 25 years without causing any problems, the pen should be removed as there has been at least one case report of a duodenal perforation caused by an ingested ballpoint pen.1 It was subsequently removed in a combined endoscopic and ear, nose and throat procedure under general anaesthetic. The pen was still in working order (figure 2). This case highlights that plain abdominal x-rays may not identify ingested plastic objects and occasionally it may be worth believing the patient’s account however unlikely it may be. CT scan demonstrating a linear foreign body in the stomach of a 76-year-old woman. 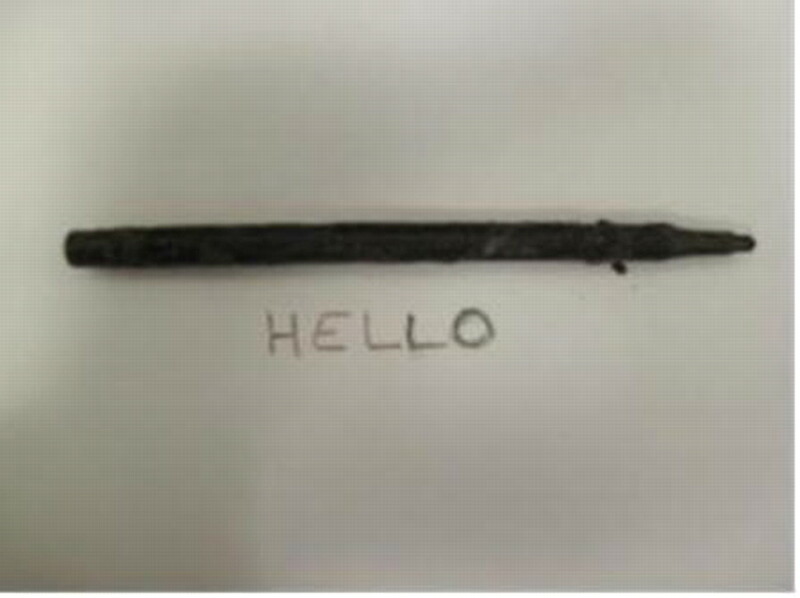 Felt-tip pen still in working order after 25 years in stomach acid.
. Duodenal perforation because of swallowed ballpoint pen and its laparoscopic management: report of a case. J Pediatr Surg 2009;44:634–6.